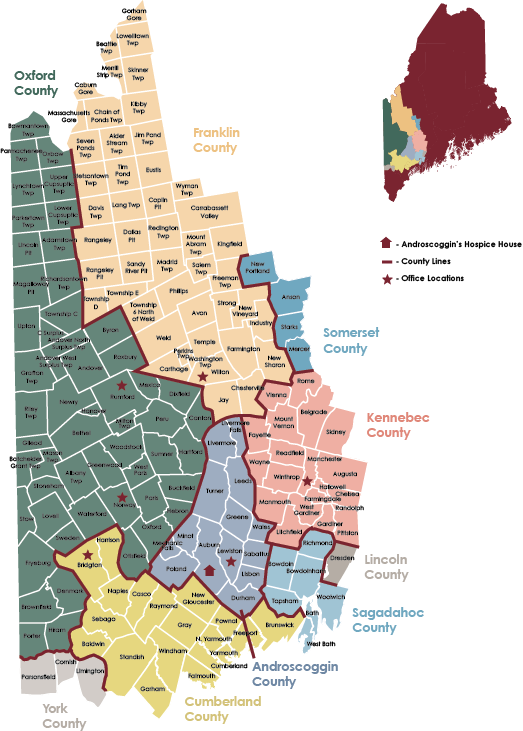 A nonprofit Medicare-certified agency based in Androscoggin County, Maine and covering Franklin, Cumberland, Kennebec, Oxford, Sagadahoc, and Somerset counties. Specialized care that anticipates, prevents and treats physical, emotional and spiritual discomfort of people with serious illness. Androscoggin’s Compass Care, a palliative health service is delivered by a highly skilled team of physicians, nurse practitioners, social workers, and others who provide assessments, make recommendations, or spend time listening, educating, and understanding patients and their families. The goal is to relieve symptoms and stress while improving quality of life. Appropriate for any stage in your illness, palliative care is an extra layer of support that can occur at the same time you are undergoing medical treatment. Speak with your doctor and request a palliative care consultation from Androscoggin Home Healthcare and Hospice, fill out the form on this page, or call our Intake Team at 207.777.7740. Sign up for updates on Androscoggin events and news.